It’s a ubiquitous summer combination. Much like barbeques and sudden onsets of drizzle, suncream and sand, and jugs of sangria peppered with canned fruit cocktail, strawberries and cream are the essence of summer. Pools of thick double cream poured over Britain’s finest berries, made all the better with a good balance of sunshine and rain to produce plump fists of scarlet sweetness that are sliced into fat halves and served as our Scottish(!) hopeful does battle on the court. As we look forward to Wimbledon unfurling the grass covers later this month, we also look forward to celebrating the berry season with those disposable bowls and spoons featuring that classic combination. To say strawberries and cream is a simple combination is indeed true, but it is also a staunch summer classic in the hearts of many. This cake was created for my wonderful Godmother’s birthday, and although I had various ideas and designs in my mind for my third tiered cake challenge, a phone call to ask what it was she wanted to see on the cake stand yielded a simple response of sponge with lashings of butter icing and jam. Simple yet classic. A wifey after my own heart. Of course, I couldn’t just leave my namesake Victoria Sponge alone, and naturally added a few touches to make this cake even more special. A few days before I made this cake, I whipped up a Strawberry and Thyme Jam, filling my kitchen with the scent of sunshine with a few savoury notes of fresh herbs. The pillow-soft sponges, flecked with warming notes of vanilla, were then layered and stacked with the most delicious clouds of double cream laced butter icing and studded with sparkling thyme leaves and those plump little berries. This is a very simple celebration cake to make, but make no mistake – it is a stunning one to serve. 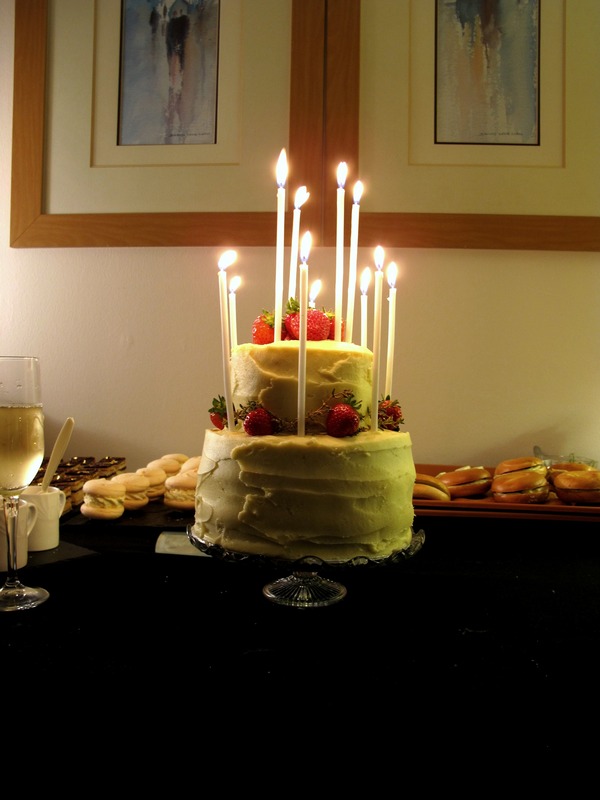 Topped with towering candles, this simple yet classic cake looks the part and I think it made my Godmother rather happy indeed. Preheat the oven to 190oc/170oc fan and grease and line three 20cm sandwich tins. The easiest way to tackle six cakes and the volume of batter is to split the cake ingredients in half and make twice. Therefore, beat half the butter in the bowl of a stand mixer for 2-3 minutes until light and smooth, then add the caster sugar and beat on high for a further 3-4 minutes until pale and fluffy. Crack in six of the eggs one by one and beat in with a tablespoon of flour to avoid the batter splitting. Sift together the flour and baking powder then fold through the batter. Stir in the vanilla and a couple of tablespoons of milk if the batter feels too heavy, then divide into the three cake tins and bake for 25 -30 minutes. Place a skewer in the middle of the cakes to see if they are cooked through, then remove from the oven and leave to cool in the tin for 10 minutes before turning out and cooling completely on a wire rack. Once cool, repeat for the second batch of cakes. 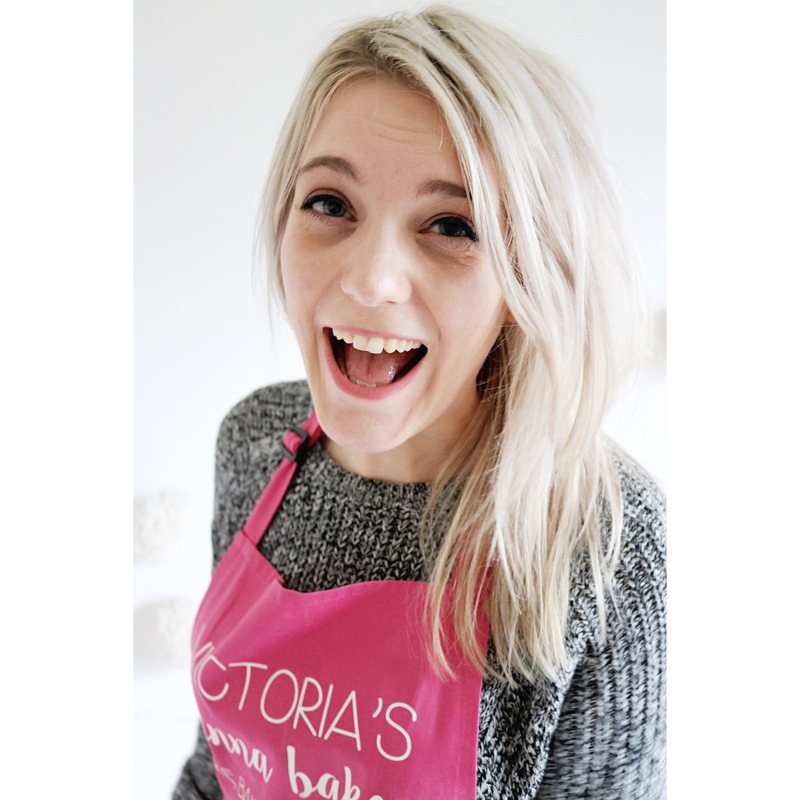 Once all six cakes have been baked, use a 4 inch round plate or plastic lid to use as a template to cut around to form the top tier on three of the cakes. Keep the remaining cake pieces and eat later smothered with leftover buttercream and jam or freeze and use as the base for trifles and tiramisu. To make the buttercream, place the butter in the bowl of a stand mixer and beat for 3-4 minutuntil light and creamy. Add the icing sugar, double cream and vanilla all at once and turn the mixer to slow to incorporate, then to high for 2-3 minutes until fluffy and light. To assemble, place a dollop of buttercream on a 20cm cake board and place one of the bigger cakes on top. Place another dollop on top of the cake and smooth to the edges using a palate knife. Place a couple of spoonfuls of jam on top of the butter cream and smooth, then repeat, stacking the two other 20cm cakes on top. Give the large cake a crumb coating to fill in the gaps of the layers and refrigerate as you tackle the smaller cake. Place one of the smaller cakes on a piece of baking parchment and repeat the buttercream and jam layers, taking care when smoothing the buttercream onto the raw edges of the cake for the crumb coating. Place the smaller cake in the fridge as you smooth over more buttercream to create a smooth finish on the larger cake, repeating with the smaller one once finished. Wash and dry the strawberries and thyme stalks and spray the herbs in bursts with the edible gold spray. Leave to dry. To assemble the cake, place the larger cake on a cake stand and place three cake rods in the middle to support the smaller cake, cut around 1cm higher than the cake. Carefully place the smaller cake on top and push down, smoothing with extra buttercream if required. 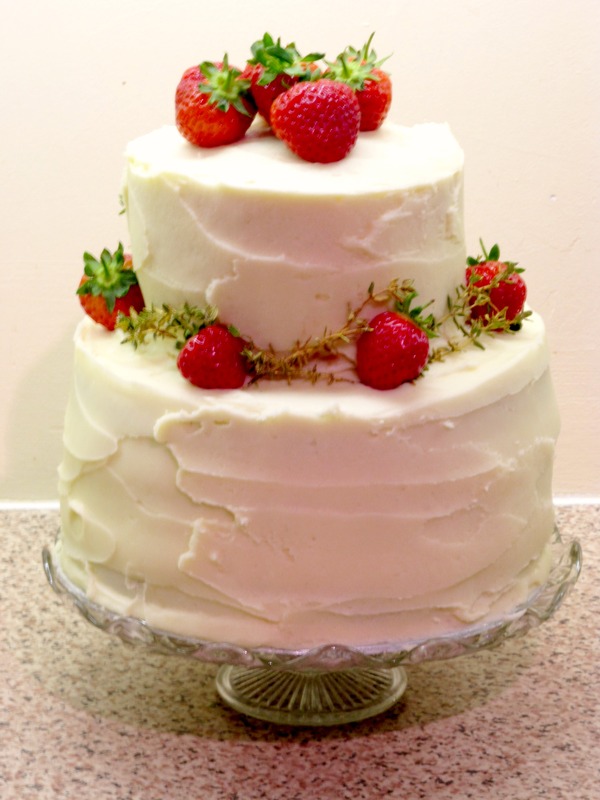 Arrange the strawberries on top and around the bottom of the smaller cake and punctuate with the golden sprigs of thyme. 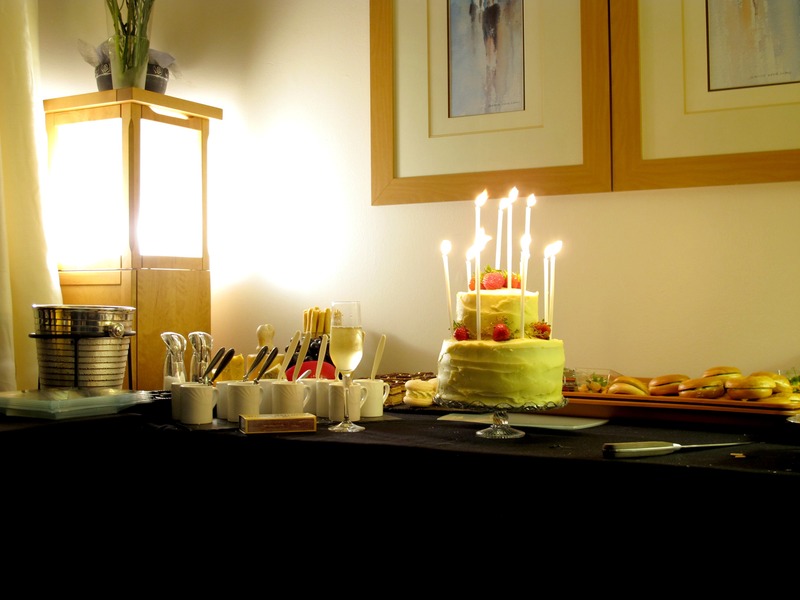 Stud with long spindly candles, light and take to the table for Happy Birthday’s and cake cuttings. 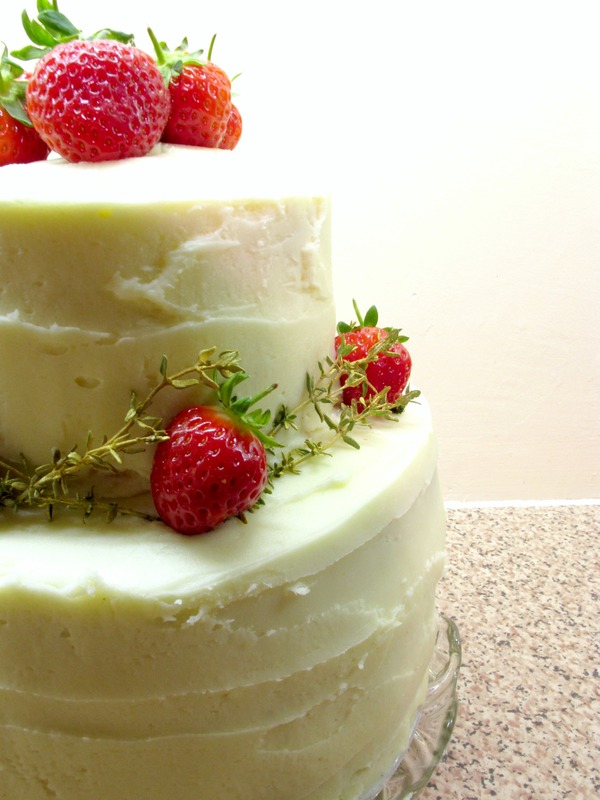 Fab looking cake, love the idea of thyme with strawberries.